A fast-moving wildfire fueled by thick, tinder-dry vegetation that hasn’t burned in nearly four decades was zero percent contained Monday night after charring 4,000 acres in the Holy Jim Canyon area of the Cleveland National Forest. Smoke from the fire can be seen in northern San Diego County. The “Holy Fire” was reported about 1:15 p.m. near Holy Jim Canyon and Trabuco Creek roads, said Orange County Fire Authority Capt. Tony Bommarito. 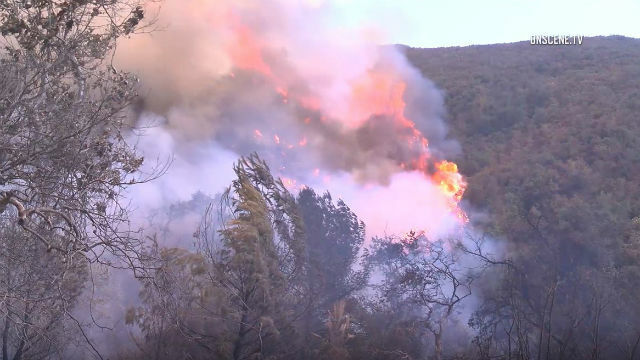 The fire was burning downhill toward Main Divide forest road at a “moderate rate of speed,” within sight of Corona, El Cerrito and Glen Ivy Hot Springs, according to the U.S. Forest Service. About 600 firefighters assisted by about a dozen water-dropping aircraft were used to control the fire, with the U.S. Forest Service taking the lead in coordinating efforts to douse the blaze. Firefighters anticipate hot, dry weather Tuesday, the U.S. Forest Service said. Two firefighters reported heat-related injuries, and they are expected to recover. Burning amid minimal wind, the blaze sent up a massive cloud of smoke that could be seen for miles in all directions. Smoke from the fire tinted the skies above north San Diego County, Corona, Riverside and Moreno Valley, turning the atmosphere a rust brown as nightfall approached. CBS2 reported two structures were destroyed. 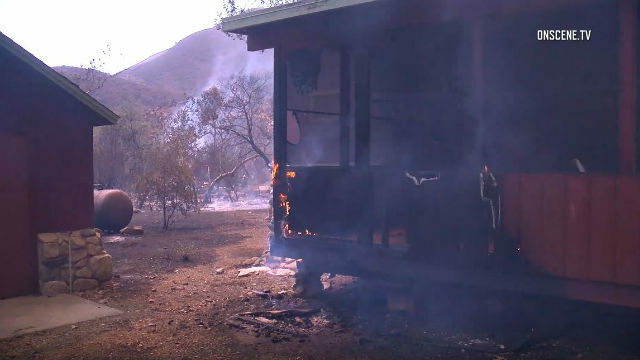 Precautionary evacuation orders were issued for the sparsely populated Holy Jim community and Trabuco Canyon area, home to dozens of weekend cabins. All campgrounds in the Trabuco Ranger District were closed and forest road closures were in effect for Trabuco Creek, Maple Springs, North Main Divide, Bedford and Indian Truck Trail. Also, Blue Jay Campground and El Cariso Campground off Highway 74 were evacuated. Crews from Orange County, Riverside County and Cal Fire were working through the dense vegetation to attempt to get a line around the blaze, but there was no likelihood of containment overnight or even Tuesday, according to reports from the scene. Cal Fire air tankers and water-dropping helicopters were requested to conduct aerial fire attack operations after sunset, even though night flying is regarded as inherently dangerous and not all water-fighting helicopters are configured to operate in darkness. The South Coast Air Quality Management District warned that during the overnight and early morning hours, downslope winds could bring smoke into the valleys west and southwest of the fire. Portions of Orange, Riverside and San Bernardino counties were likely to be affected. “Air quality may reach unhealthy levels or higher in areas directly impacted by smoke,” according to an SCAQMD statement. The OCFA said residents in the Holy Jim area can call the fire hotline at (714) 628-7085 for updates.